Did you know that Macaroni Grill had a new line of Frozen entrees? They are designed to give you a delicious Italian food experience within the comfort of your own home. Available in the freezer section of your local grocery store this summer, Macaroni Grill frozen entrées contain delicious authentic Italian flavors inspired by the Macaroni Grill Restaurant you know and love. 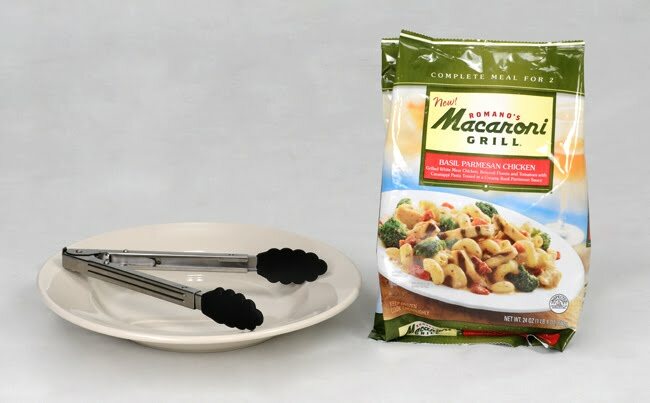 The four new Macaroni Grill frozen entrées are perfect for quickly and conveniently recreating premium quality meals right in your own kitchen. I recently had the opportunity to try the Macaroni Grill Frozen Entree in Grilled Chicken Florentine. 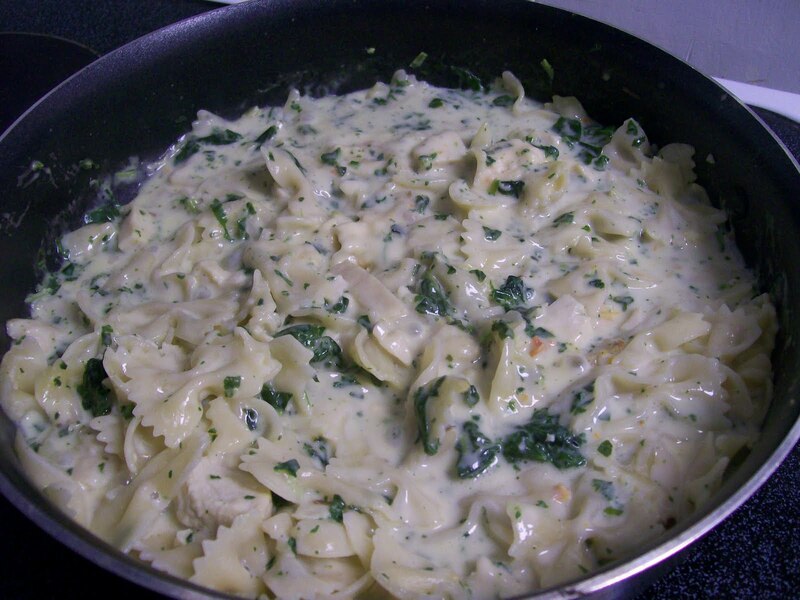 I was very excited to try this because Chicken Florentine is one of my favorite pasta dishes (second only to alfredo). Before I even opened the package, I was immediately impressed by this product because I found this was something I could make in less than 20 minutes on the stove top. Furthermore, the only additional ingredient I would need was a little milk. For anyone who’s ever been pressed for time or found themselves having to make dinner at the last minute (and I daresay, that’s probably all of us), you know how convenient it is to have something like this on hand! 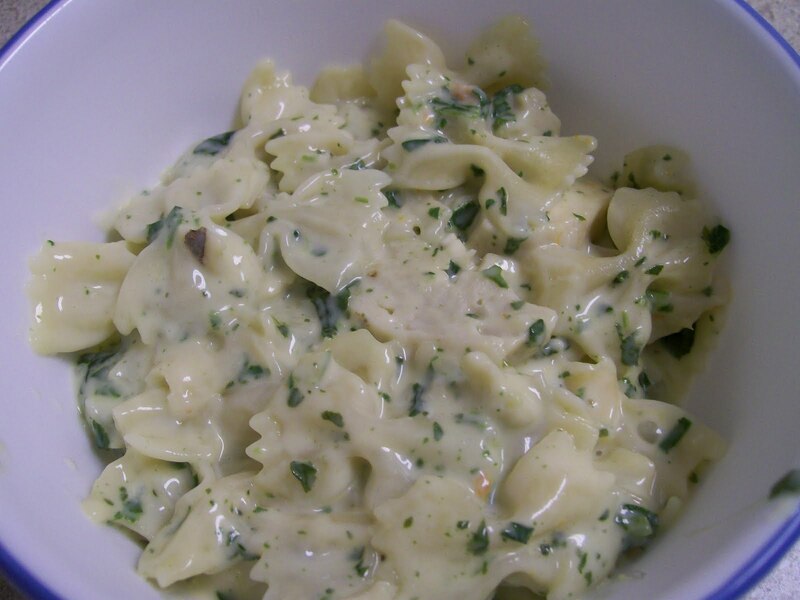 The entree features Grilled White Meat Chicken, Spinach with Farfalle Pasta, and a Creamy Parmesan Cheese and Garlic Sauce. Upon cooking this meal, I was very impressed by the quality of the ingredients, including the chunks of spinach (as opposed to tiny specks). And I was very impressed by the overall flavor of this dish, especially the taste of the cream sauce. Furthermore, my husband, who seems to be the authority on taste in our house, was very impressed by the meal, and he concluded that he’d definitely like to eat it again in the future. Finally, the size of the entree was just perfect for the two of us. Obviously, most of my readers have children and would need food for more than two people, but I figure you can always buy more than one package if you need it. Right? And then again, I think if you served everyone a salad and bread to go with this, you could possibly stretch it out to feed 3 or 4. Overall I’d recommend this product to anyone who loves Italian food and is looking for a new quick and convenient meal to make at home. Buy it! If you’d like to try Macaroni Grill’s new frozen entrees, they are now available in the freezer section of your local grocery store. Go to Macaroni Grill at Home to print out a coupon for $1.50 off. Connect! Follow Macaroni Grill on Twitter. Or check them out on Macaroni Grill on Facebook. Win it! One Simply Sweet Home reader will win a prize pack which includes one of the new Macaroni Grill Frozen Entrees, a pasta dish, and tongs. Giveaway Closed. Congrats to Jenn at Just Getting Started! Disclosure: Information, frozen sample, prize pack and giveaway have all been provided by Macaroni Grill through MyBlogSpark. The opinions in this post are mine. I'd like to try the basil parmesan chicken. The basil parmesan sounds delicious!! Thanks, great giveaway! I have one of your buttons on my blog, thanks! I'd love to try the basil parmesan chicken! yum – spicy Italian sausage has my name all over it! Thanks for the opportunity. I would like to try the roasted garlic shrimp scampi. Sounds good, quick, and easy. Love it! I'd like to try either the basil parmesan chicken or the grilled chicken florentine. I'd be new to both, but I LOVE Macaroni Grill! I'd luv to try the Roasted Garlic Shrimp Scampi…sounds yummy, thanks. I'd love to try the Basil Parmesan Chicken–sounds delicious! Thanks! I subscribe to your feed on Google Reader. I like the Creamy Basil Parmesan Chicken. I want to try the Spicy Italian Sausage Pomodoro. OH YUM! This looks delish! I'd love to win!! I'm loving your blog and I'm so excited to be your newest follower! I would also like to invite you to my link party/giveaway every Friday at FrouFrouDecor! I love new friends and hope to see you there! I like Roasted Garlic Shrimp Scampi. I'm a Romano's Macaroni Grill FB Fan~ Jennifer L.
I would like to try -Grilled Chicken Florentine. I'm an alfredo person too, and never had Grilled Chicken Florentine before. But if that's your favorite, next to alfredo, then that's the one I want to try! We'd love to try the Shrimp Scampi-Thanks for the chance to win! love to try Grilled Chicken Florentine. love that restaurant and it would be wonderful at home! Would like to try the grilled chicken florentine. The Roasted Garlic Shrimp Scampi sounds quite tasty. I'd love to try the basil parmesan chicken. 1. I'm following you on Twitter @neverdene. 2. I'm following you on Twitter @neverdene. 1. I subscribed to your blog via email. 2. I subscribed to your blog via email. 1. I subscribed to the blog's RSS feed via Google Reader. 2. I subscribed to the blog's RSS feed via Google Reader. I'm following MG on Twitter (@neverdene). I'd love to try the Spicy Italian Sausage Pomodoro! I'd love to win the Basil Parmesan Chicken! Yummy! 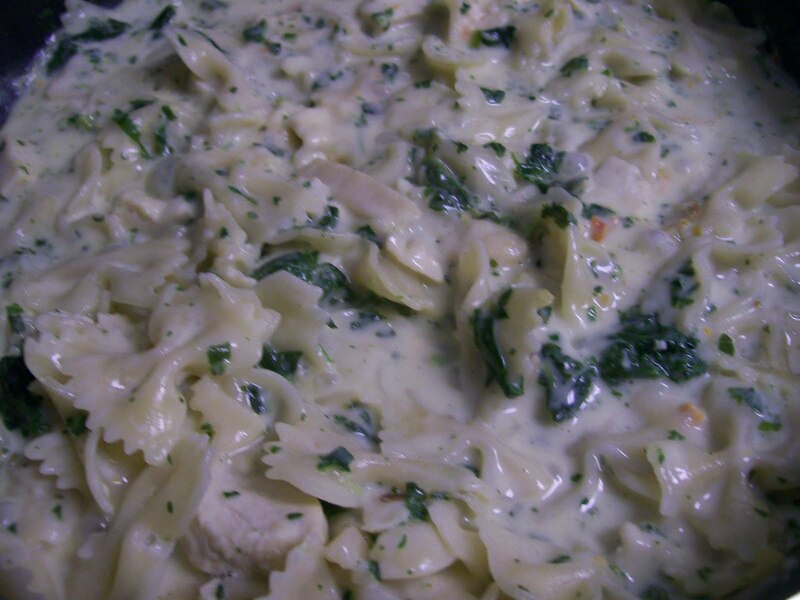 Chicken Florentine is my kids favorite and I'd love to try a shortcut to making it! I love shrimp so I'll say the Roasted Garlic Shrimp Scampi. We love Macaroni Grill. Thanks for the wonderful giveaway. I just became a Google Friend Connect follower. Thanks for the chance.